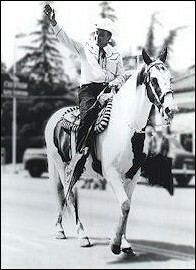 Cliffie was quite a horseman at one time and he owned several horses – his favorite was ‘Sunbeam’ which he enjoyed riding on the numerous trails of Santa Clarita. In the above photo, Cliffie was the Grand Marshall of Newhall’s 4th of July parade, which is in the Santa Clarita Valley. He’s riding his favorite horse, Sunbeam, who loved a parade as much as Cliffie did!